Senior midfielder Michael Gottlieb and junior attack Michael Mauricio registered four goals apiece for Brunswick, which displayed its impressive depth on both ends of the field in its decisive 19-9 victory against New Canaan before a big crowd at Dunning Stadium. Sophomore midfielder Luke Waters and senior midfielder AJ Delgado each recorded hat tricks for the Bruins, who improved their record to 7-0. Coulter Mackesy, a sophomore, had one goal and two assists, while senior Cooper Moore, junior Brody Firestein and junior Liam Fairback each tallied one goal and one assist for the Bruins. The Rams’ record stands at 2-3 following the defeat. Christian Barnard, a senior, made six saves in goal for the Bruins, who were led defensively by senior Ian Murray and in the defensive midfield by Edward Glassmeyer and Tim Saunders. Senior Carl Mazabras started in goal and junior Bennett Ong was in goal in the second half for New Canaan, which lost at Brunswick last season. The Bruins took the lead for good at 5-4 when Waters found an opening with a dodge and converted a shot with 10:17 to go in the second quarter. Firestein tallied at the 8:36 mark off a dodge, making it 6-4. Gottlieb went low with his shot in transition, giving the visitors a 7-4 edge with 7:33 remaining in the second quarter. Canet’s man-up goal brought the Rams to within 7-5 at the 7:10 mark, but the Bruins capped the first half with five straight goals. Moore converted a shot from 15 yards out, then Mackesy tallied off a Delgado feed, putting Brunswick up, 10-5. With Coby Ginder winning the faceoff, Mauricio scored after receiving a Glassmeyer pass, bringing the score to 11-5. As the game progressed, it became apparent just how difficult it is to defend the Bruins, who have eclipsed double-digits in scoring in each one of their games. Senior midfielder William Rechtermann tallied off a Nolan feed with 7:16 left in the third quarter, cutting the Bruins’ lead to 12-6, but Brunswick responded with two straight goals. 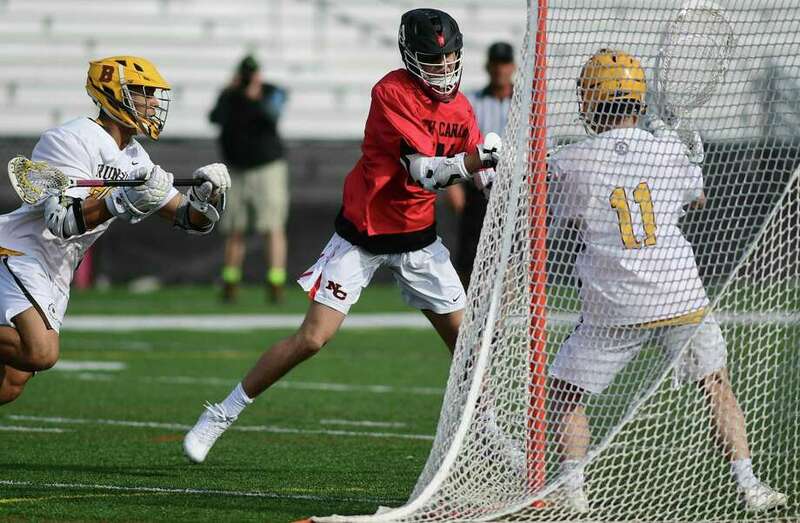 Mauricio scored with 5:52 remaining in the third quarter, then Waters found the back of the net with a perimeter shot, putting New Canaan in a 14-6 hole at the 4:54 mark. “We were moving the ball really well and keeping the defense guessing by moving it to the back side with a lot of quick dodges,” Gottlieb said. Glassmeyer and junior Logan Derrin each gathered five ground balls in the winning effort. Brunswick hosts Lawrenceville School on Wednesday at 4 p.m. New Canaan hosts Norwalk on Tuesday. Scoring: B — Michael Mauricio 4 g, 1 a; Michael Gottlieb 4 g, 1 a; Luke Waters 3 g, 2 a; AJ Delgado 3 g, 1 a; Coulter Mackesy 1 g, 2 a; Christian Ronda 3 a; Liam Fairback 1 g, 1 a; Cooper Moore 1 g, 1 a; Brody Firestein 1 g, 1 a; Tucker Slattery 1 g; Edward Glassmeyer 1 g; NC — Quintin O’Connell 2 g; Christopher Canet 2 g, 1 a; Liam Griffiths, Luke Nolan 2 g, 2 a; Rechtermann; Matthew Cosco 1 a; Jack Finnigan 1 a; Goalies: B — Christian Barnard (6 saves), Will Prout (2 saves); NC — Carl Mazabras (5 saves), Bennett Ong (5 saves).